The new MUSE instrument on ESO’s Very Large Telescope (VLT) has provided researchers with the best view yet of a spectacular cosmic crash. The new observations reveal for the first time the motion of gas as it is ripped out of the galaxy ESO 137-001 as it ploughs at high speed into a vast galaxy cluster. The results are the key to the solution of a long-standing mystery — why star formation switches off in galaxy clusters. A team of researchers led by Michele Fumagalli from the Extragalactic Astronomy Group and the Institute for Computational Cosmology at Durham University, were among the first to use ESO’s Multi Unit Spectroscopic Explorer (MUSE) instrument on the VLT. 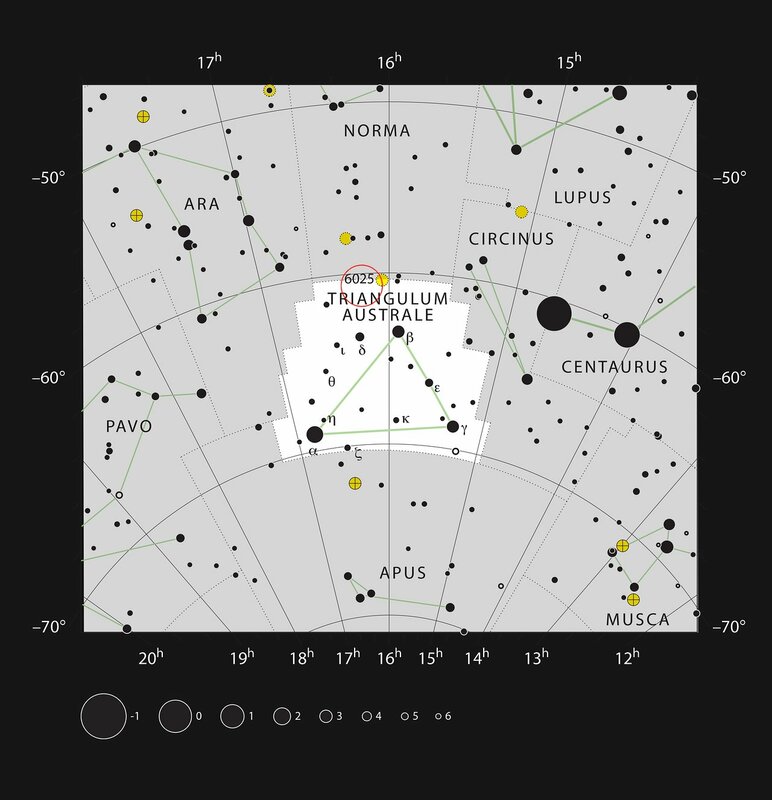 Observing ESO 137-001 — a spiral galaxy 200 million light-years away in the southern constellation of Triangulum Australe (The Southern Triangle) — they were able to get the best view so far of exactly what is happening to the galaxy as it hurtles into the Norma Cluster. 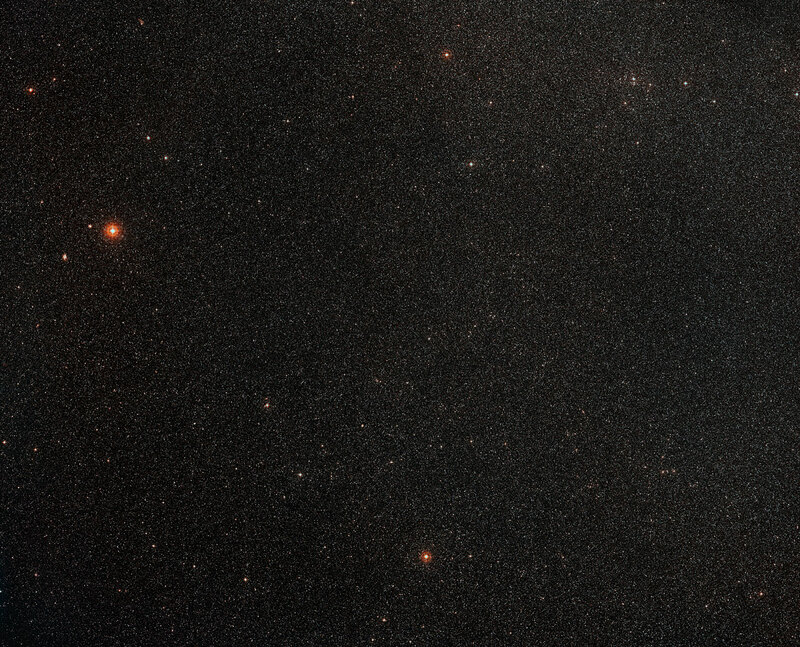 MUSE gives astronomers not just a picture, but provides a spectrum — or a band of colours — for each pixel in the frame. With this instrument researchers collect about 90 000 spectra every time they look at an object, and thereby record a staggeringly detailed map of the motions and other properties of the observed objects . ESO 137-001 is being robbed of its raw materials by a process called ram-pressure stripping, which happens when an object moves at high speed through a liquid or gas. This is similar to how air blows a dog’s hair back when it sticks its head out of the window of a moving car. In this case the gas is part of the vast cloud of very thin hot gas that is enveloping the galaxy cluster into which ESO 137-001 is falling at several million kilometres per hour . The galaxy is being stripped of most of its gas — the fuel needed to make the next generations of young blue stars. 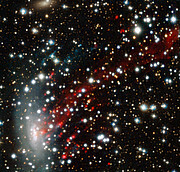 ESO 137-001 is in the midst of this galactic makeover, and is being transformed from a blue gas-rich galaxy to a gas-poor red one. Scientists propose that the observed process will help to solve a long-standing scientific riddle. Observing this cosmic spectacle, however, is no mean feat. The Norma Cluster lies close to the plane of our own galaxy, the Milky Way, so it is hidden behind copious amounts of galactic dust and gas. With the help of MUSE, which is mounted on one of the VLT’s 8-metre Unit Telescopes at the Paranal Observatory in Chile, scientists could not only detect the gas in and around the galaxy, but were able to see how it moves. The new instrument is so efficient that a single hour of observing time was sufficient to obtain a high resolution image of the galaxy as well as the distribution and motion of its gas. 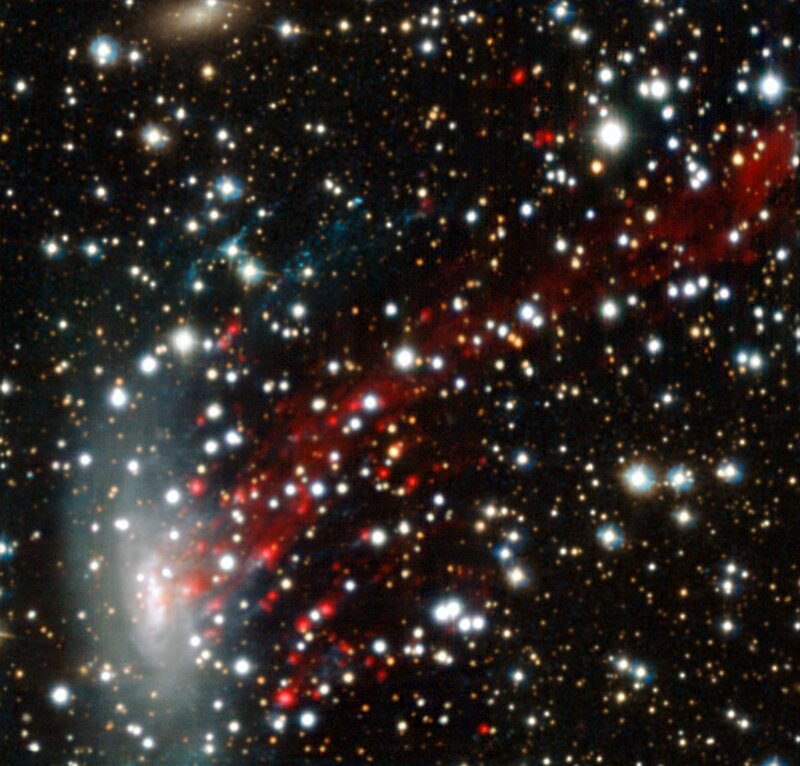 The observations show that the outskirts of ESO 137-001 are already completely devoid of gas. This is a result of the cluster gas — heated to millions of degrees — pushing the cooler gas out of ESO 137-001 as this drives towards the centre of the cluster. This happens first in the spiral arms where the stars and matter are more thinly spread than at the centre, and gravity has only a relatively weak hold over the gas. In the centre of the galaxy, however, the gravitational pull is strong enough to hold out longer in this cosmic tug-of-war and gas is still observed. 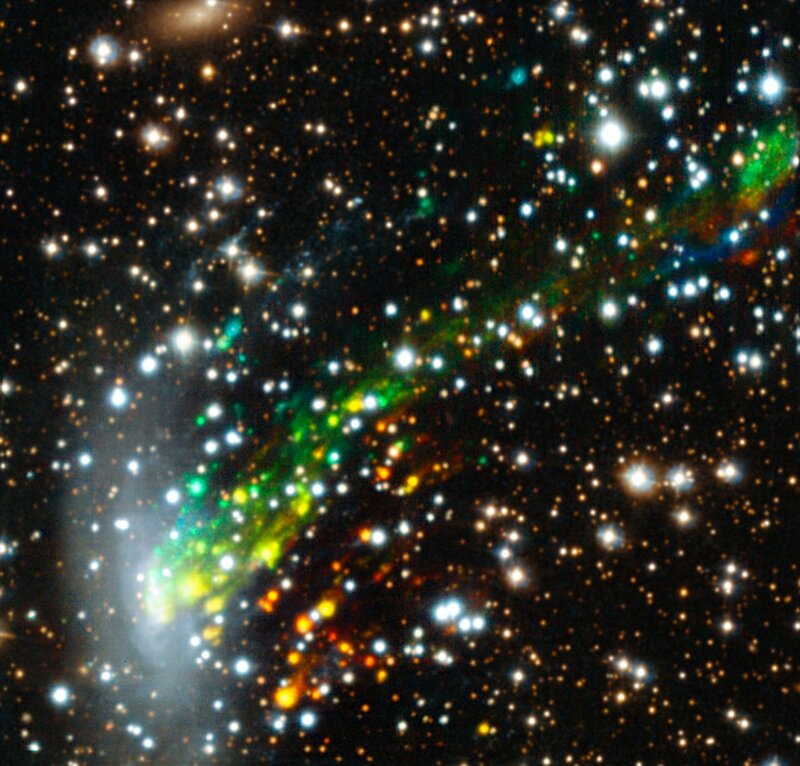 Eventually, all of the galactic gas will be swept away into bright streaks behind ESO 137-001 — telltale remnants of this dramatic robbery. 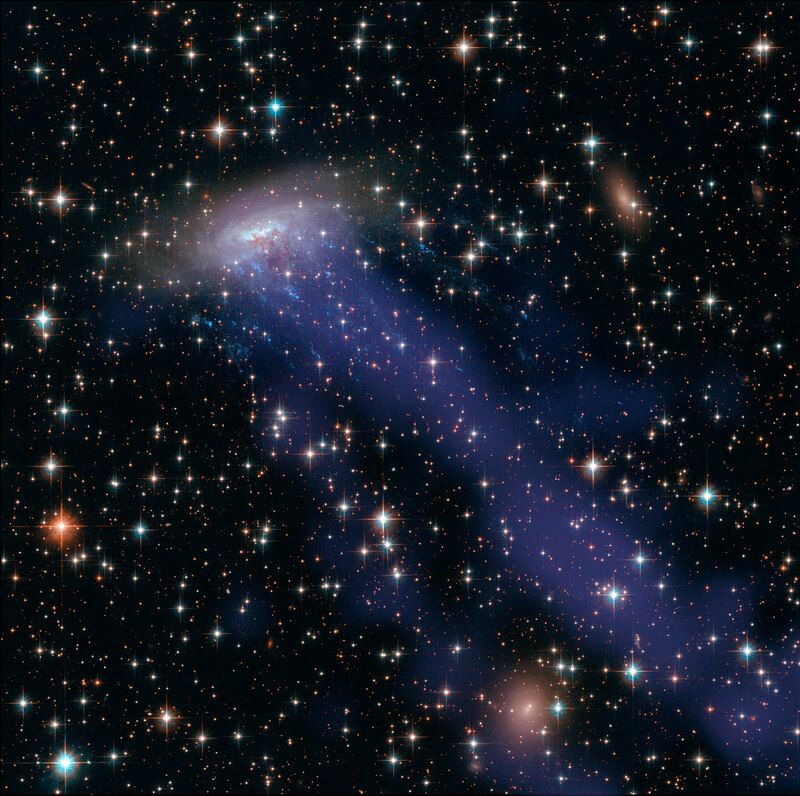 The gas that is torn away from the galaxy is mixed with the hot cluster gas to form magnificent tails extending to a distance of over 200 000 light-years. The team had a closer look at these streams of gas to better understand the turbulence created by the interaction. Surprisingly the new MUSE observations of this gas plume show that the gas continues to rotate in same way the galaxy does, even after being swept out into space. Furthermore, researchers were able to determine that the rotation of stars in ESO 137-001 remains unchanged. This provides further evidence for the cluster gas, not gravity, being responsible for stripping the galaxy . MUSE is the first large integral field spectrograph ever installed at an 8-metre telescope. As a comparison, previous studies of ESO 137-001 collected no more than 50 spectra. The NASA/ESA Hubble Space Telescope has provided a spectacular image of this object — but, unlike MUSE, cannot reveal the motions of the material. If gravity were to play a role in the stripping process, the researchers would have expected to see disruptions within the galaxy. This research was presented in a paper entitled “MUSE sneaks a peek at extreme ram-pressure stripping events. I. 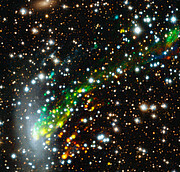 A kinematic study of the archetypal galaxy ESO137-001” to appear in Monthly Notices of the Royal Astronomical Society on 10 November 2014. The team is composed of Michele Fumagalli (Extragalactic Astronomy Group and Institute for Computational Cosmology, Durham University, United Kingdom), Matteo Fossati (Universitäts-Sternwarte München and Max-Planck-Institut für extraterrestrische Physik, Garching, Germany), George K. T. Hau (ESO, Santiago, Chile), Giuseppe Gavazzi (Università di Milano-Bicocca, Italy), Richard Bower (Extragalactic Astronomy Group and Institute for Computational Cosmology, Durham University, United Kingdom), Alessandro Boselli (Laboratoire d'Astrophysique de Marseille, France) and Ming Sun (Department of Physics, University of Alabama, USA).